SUM-DAK-MMR1 Dodge RAM SRT10 MirrorRear view mirrors have an outdoor temperature indicator and a path point compass system. The temperature indicator accurately displays from -31 degrees to 131 degrees, +/- 3 degrees F, and the compass displays vehicle headings of N, NW, W, SW, S, SE, E, and NE. Their great looking vacuum fluorescent digital display. 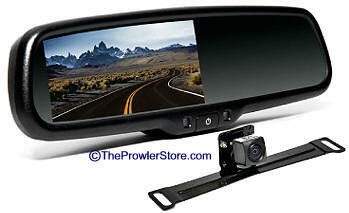 Our OEM Style Mirror Monitor provides ultimate performance together with a clean, factory like install. It attaches to the windshield, either connecting to, or replacing the existing rear view mirror (see item options) and its bright screen and reflective ability contribute to an all-in-one backup experience. It comes with a 4.3" Color TFT Digital Display and its distance grid lines are optional and adjustable. SELF Contained! Does NOT need your cars computer system!